Shirts With Random Triangles: Alabama Tailback Atlee Tenpenny Arrested For Marijuana Possession Over Spring Break. Alabama Tailback Atlee Tenpenny Arrested For Marijuana Possession Over Spring Break. 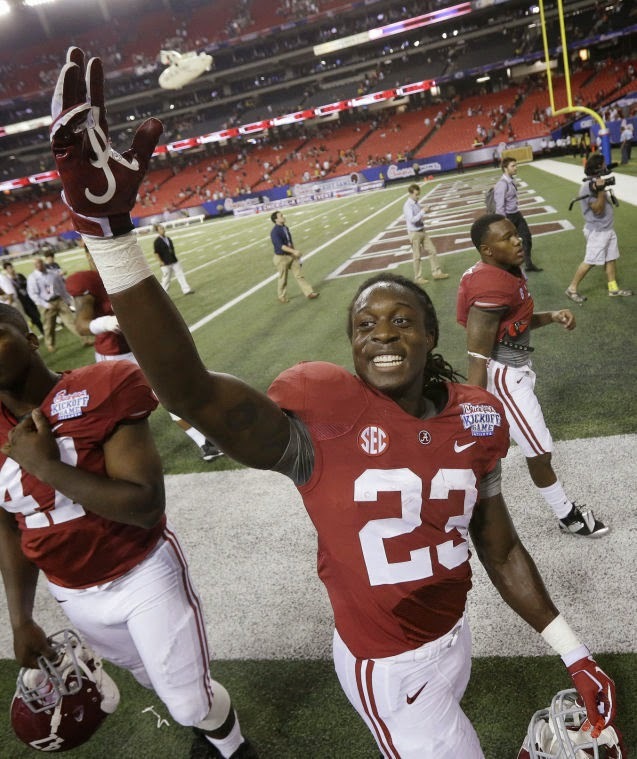 An Alabama player spent part of his spring break in police custody. Sophomore tailback Atlee Tenpenny was arrested in his home town of North Little Rock, Ak. on charges of "possession of a controlled substance" (in this case, marijuana) on March 24. "According to the incident report, Tenpenny was pulled over March 24 because of an "inoperational license plate light." After the officer detected "the odor of burnt marijuana," Tenpenny, who was described by the arresting officer as "extremely nervous," told the officer he "smoked a blunt" earlier in the night but initially denied that there was any in the vehicle." A search of the vehicle by police resulted in the discovery "a clear plastic bag filled with 2.1 grams of marijuana. "Tenpenny admitted to police that he was aware the bag was in the vehicle. He was then "transported to the police station. He was released with a citation." In a statement, Alabama head coach Nick Saban stated that he was "aware of the situation," and that Tenpenny would "have some internal discipline as well as education" along with any legal punishment. Tenpenny is scheduled to appear in court in regards to the charges on April 10.